Escapada de un día de Oahu a Kauai: Cañón de Waimea y Fern Grotto. Jet set desde Oahu hasta Kauai y pase el día conociendo otra isla. 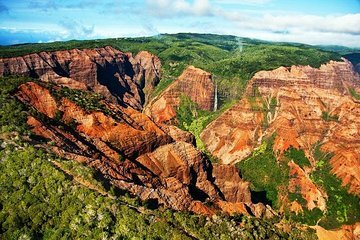 Deje la conducción y la logística a su guía y relájese en la comidad del aire acondicionado mientras ve los puntos de interés de Kauai como el cañón de Waimea, La arboleda Coco Palms, y Fern Grotto. Vea un antiguo bosque de eucaliptos, una cascada tropical y aprenda sobre la cultura hawaiana con una actuación de hula. Kauai is beautiful and I really enjoyed driving around and seeing everything. The stop at the waterfall was uneventful and I know there are much prettier options out there. The area we stopped for food and shaved ice was awesome. The canyon was amazing. Fern gratto wasn't quite what I expected but I'm glad we went. All in all it was a nice tour but I would probably have cut a few things out to make room for driving further north. Nice trip! The tour guide was great. An excellent day trip. Our tour agency did an excellent job of confirming all of our travel and went off without a hitch. WEATHER DID NOT COOPERATE CLOUDS PREVENTED SEEING THE CANYON.